‘Bench Series 36’: Metal Bench! Jude, Author of ‘Travel Words’, a wonderful blog inspired by her travel notes and diaries over the years runs a great linky called ‘Bench Series’. Here’s my first contribution: I took this shot on a bright morning this February. It was the first day this year when you could really feel the sun: I walked down to the Herne Hill weekend market, and South London seemed to be smiling – as though the sun had lifted the weight of winter chill. This photo is taken from the top of the hill in Brockwell Park. 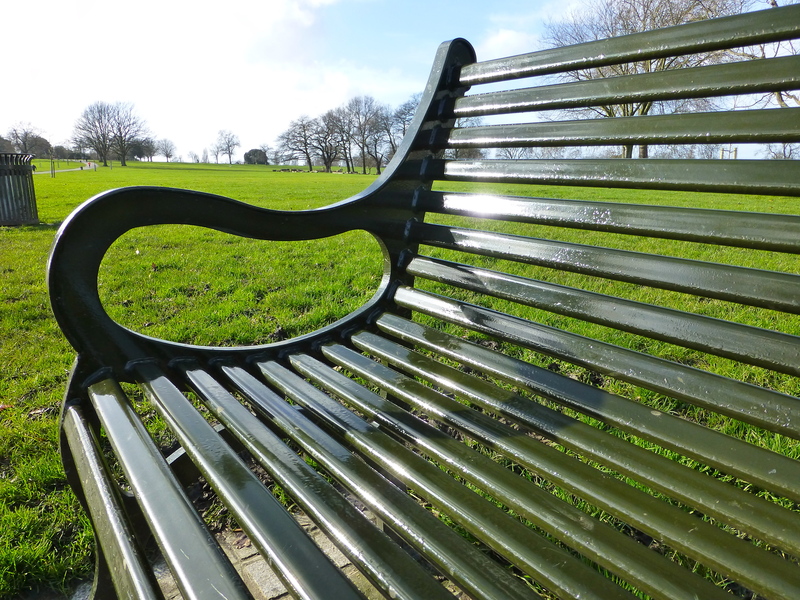 Sitting on the bench, there are wonderful views over the London Skyline. But I thought smooth curve of the metal arm, with the bright sun brimming thorouh and bouncing off the bench rails, was a good sight too! and other contributions too: ‘Bench Series’: September – Metal Benches. Valadero is the closest I’ve got to a classic ‘paradise’ holiday. If it’s the closest I ever get, that will be just fine! Near enough to Havana, and a perfect foil to that city’s bustle and mesmerising wonders, a trip west to what is possibly the Caribbean’s most exquisite stretch of beach resorts. A sunny, slim peninsular edged by over 20 km of white sandy beaches and clear waters. The first tourists visited Varadero as early as the 1500, and for centuries it was considered an elite resort for Spanish conquistadors. Tourism there remains the greatest source of income by a long way… in a way, it’s an escape from ‘real life’ – for Cubans, too – there is a check gate to pass on the way into the resort, and Cubans have to have a reason for passing through: it’s not a residential area, and access is restricted. For true relaxation, we choose a hotel resort with even further access restrictions: No Children! Lovely as they undoubtedly are, not having their excitement, energy and noise meant that the atmosphere was deeply relaxed. An ‘all inclusive’ holiday, well done, has to be the best way to relax and re-charge. For me, it was like ‘detox’. Everybody needs that once in a while. Holiday Info: We stayed at the Royalton Hicacos Resort – All inclusive luxury: Royal Hicacos Resort, Valadero, Cuba. I booked a two destination holiday with The Holiday Place – if they haven’t got a ‘package’ you want, then you can choose which hotel you’d like to stay in, and they’ll tailor the holiday for you. I will use them again – and hope to return to the Royalton Hicacos before too long, as well. Cuba, Valadero, Early Morning on the beach.